I came to my senses and rode the exercise bike again this a.m., before I did anything else. It’s amazing to me, how much more awake I feel, after I finished my (relatively short) ride. One of the things about TBI is that it can slow down the brain’s processing. That makes total sense, if the usual connections are sheared and the impulses need to hunt around for other ways to get where they’re going. It’s like the Loma Prieta earthqake in the SF Bay area back in the late 1980s – a former co-worker of mine spent 4 hours trying to get home from work, when the drive usually took them 45 minutes, tops. All the usually routes were washed out or diverted. And when they got home, their apartment was fine and there was no sign of anything having gone wrong… but all the dishes and glasses were lying smashed on the kitchen floor. Apparently, the building had rocked one way far enough to open all the cupboard doors, empty the shelves onto the floor, and then it rocked back and closed all the doors neatly. 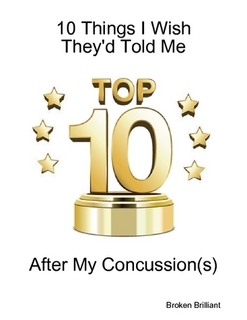 I tend to think about TBI the same way — especially Mild TBI. Our world is rocked, and things get broken inside, but then we get rocked back into place, and as far as anyone can tell, we’re just fine. But all our dishes and glasses are lying smashed on the floor — and we have to tread carefully to not cut ourselves. And the routes our thought processes normally take to get to and from where they’re going are also diverted and changed. So, it takes us longer to get where we’re going. Absent restoring my brain to its original condition — as if there ever was such a thing, as I’ve been having mild TBIs since I was 7 — I can do some things to help it along. This morning, I did some of those things — exercised, and then had a big glass of water, ate my breakfast, and took my vitamins. I am religious about breakfast — high fiber cereal with rice milk, a cup of coffee, and a piece of fruit. I’ve really cut back on coffee — I have a mug in the morning and another in the afternoon (no longer the 3-4 big mugs each day). And when I have it, I make a point of eating something while I’m drinking it, so it doesn’t upset my stomach. This morning, I had a banana with my breakfast. I’ve read that a banana and coffee will help your brain work better. The potassium in the banana helps, and the caffeine helps with the absorption. Or something like that. I also (amazingly enough) remembered to take my supplements. Basically, my morning brain boost is about helping my brain get going in the morning and stay that way. I take the B-Complex to help my nerves, so I don’t get physically taxed by stress, which then fogs my mind. I take the oils for the brain and cellular support, and I take the chromium picolinate to help with how my body handles glucose. The brain is the Number One consumer of glucose in the body. It needs it to survive — to think properly and to keep its energy level up. There’s good reading over at http://www.fi.edu/learn/brain/carbs.html — I’ll post a tiny bit of it below, but please follow the link to get the whole story. Your brain cells need two times more energy than the other cells in your body. Neurons, the cells that communicate with each other, have a high demand for energy because they’re always in a state of metabolic activity. Even during sleep, neurons are still at work repairing and rebuilding their worn out structural components. They are manufacturing enzymes and neurotransmitters that must be transported out to the very ends of their– nerve branches, some that can be several inches, or feet, away. Most demanding of a neuron’s energy, however, are the bioelectric signals responsible for communication throughout the nervous system. This nerve transmission consumes one-half of all the brain’s energy (nearly 10% of the whole body’s energy). Interestingly, one of the points of this web page is that the brain needs carboyhydrates to function properly. It pretty much pointed me away from those low-carb diets that everyone is crazy about. Especially with my head injury history, I’m not going to deprive my brain of its primary source of energy — carbs. I’m just going to be smart about it. As in, balance my carbs with other things — if I have bread, I’ll have it as part of a sandwich that has plenty of protein and extras on it, like lettuce and tomatoes and other stuff, if possible. If I have crackers, I’ll have an apple (fresh with the skin on) to complement it. And if I’m really craving carbs, that won’t be the only thing I have. Well, anyway, I have a full day ahead of me, and I’m off to a good start. It’s wild, how much of a difference just 15 minutes of aerobic exercise helps me. That, and my brain boost breakfast. Stay strong everyone — and eat right! Found a video for free on YouTube. Posted. Thanks again. Cool, I’m going to follow up on this too and continue to research it, I’ll drop back in down the line with some findings–or at leas at my best shot at collecting the evidence. Thank you for posting this material on the blog, it’s an excellent resource. You are very welcome. Looking forward to seeing what you find.